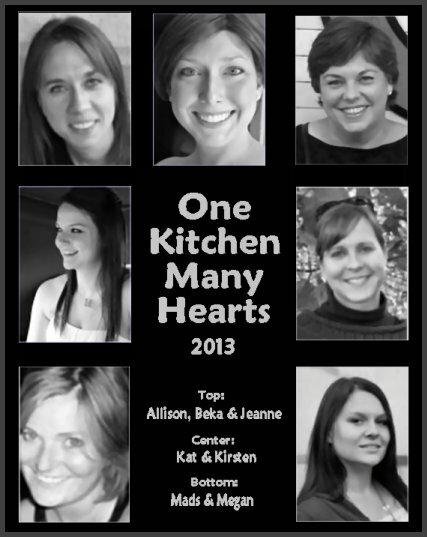 It’s that time again, kids – time for another One Kitchen Many Hearts box. Wahoo! I love mail days like OKMH, where blogging buddies send care packages to one another round-robin-style. 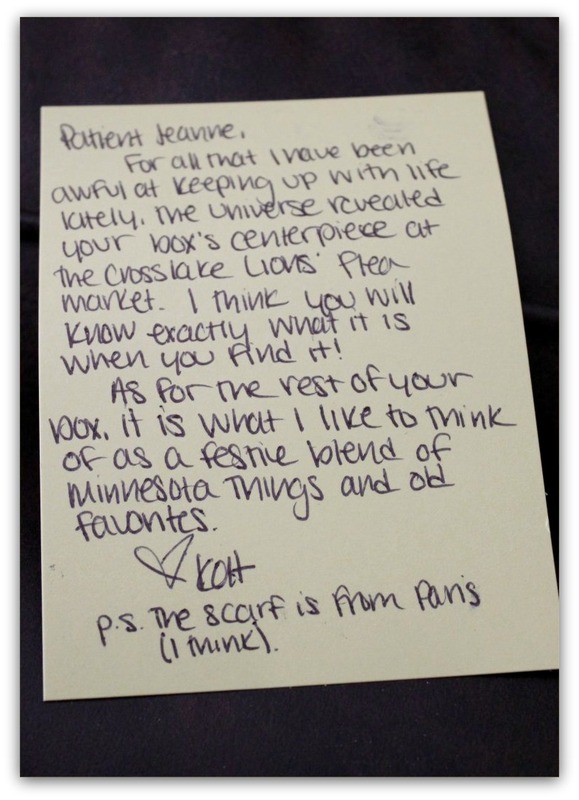 For October, I sent a box of love to Madelyn in California and received a box from Kat in Minnesota. Here’s what Kat sent. It started with this card. So much promise in a 4×6 format. As promised, there was so much to squeal over. 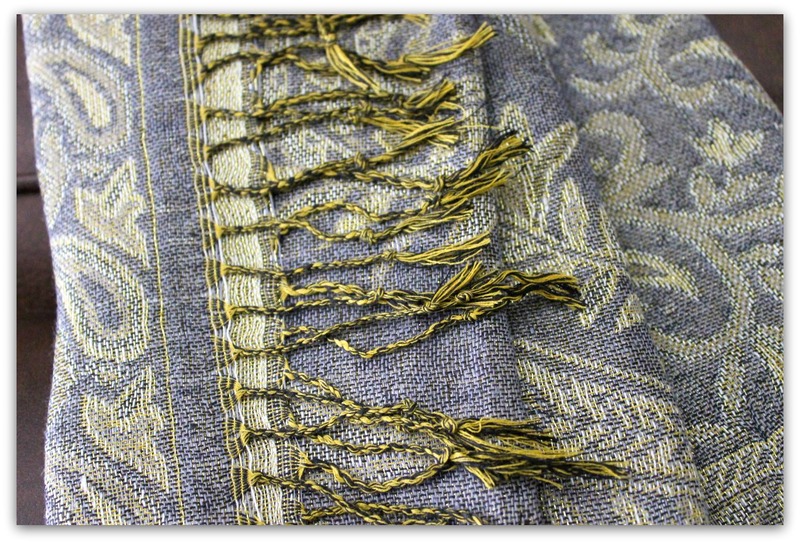 As the postscript hints, there was a pashmina (possibly from Paris) in a lovely blue hue. So pretty. Ooo la la! And two bags of what can only be deemed the Rolls Royce of rice. I already have plans that involve roasted chicken with mushrooms and grilled shrimp with lemons. Or maybe a wild rice salad with dried cranberries, oranges and nuts. So many possibilities hidden in those gorgeous ebony grains. In sharp contrast, these next goodies have no possibility of lasting. Zero. Zip. Zilch. No mincing words here. That Caramello Bar died instantly. Thankfully, it was a quick & painless death. I made sure of that. It wasn’t pretty, but it was quick. These are lasting a little longer, but not by much. Okay, confess. 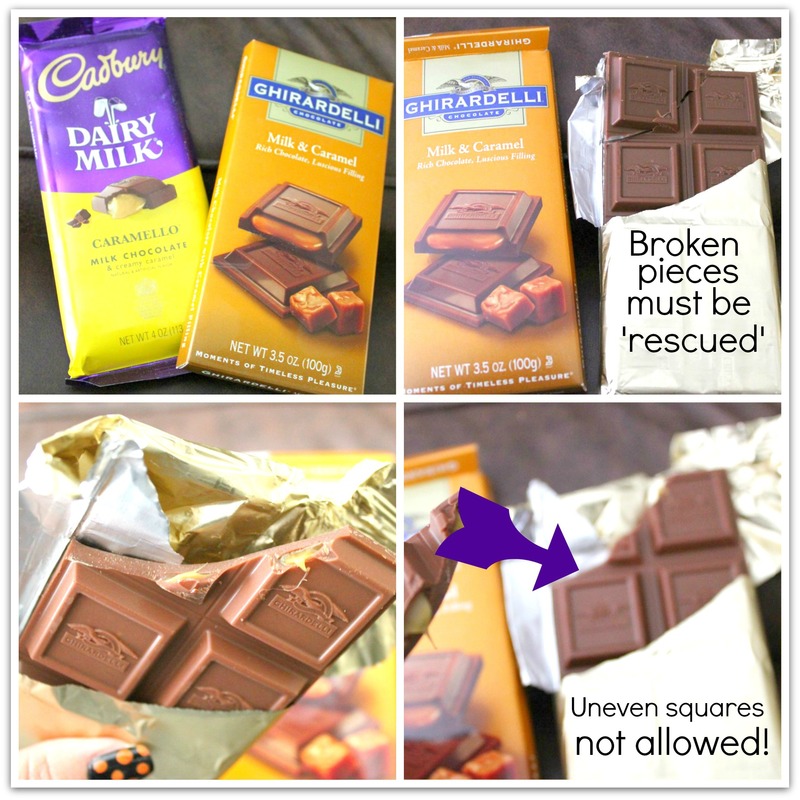 When you see a chocolate bar with grid lines, and that bar breaks contrary to said lines, are you compelled to ‘fix’ it by evening it up? To the point that you may eat additional squares just to make sure the bar is neatly within the lines? No? Tell the truth! It can’t just be me! Yes, I color within the lines. 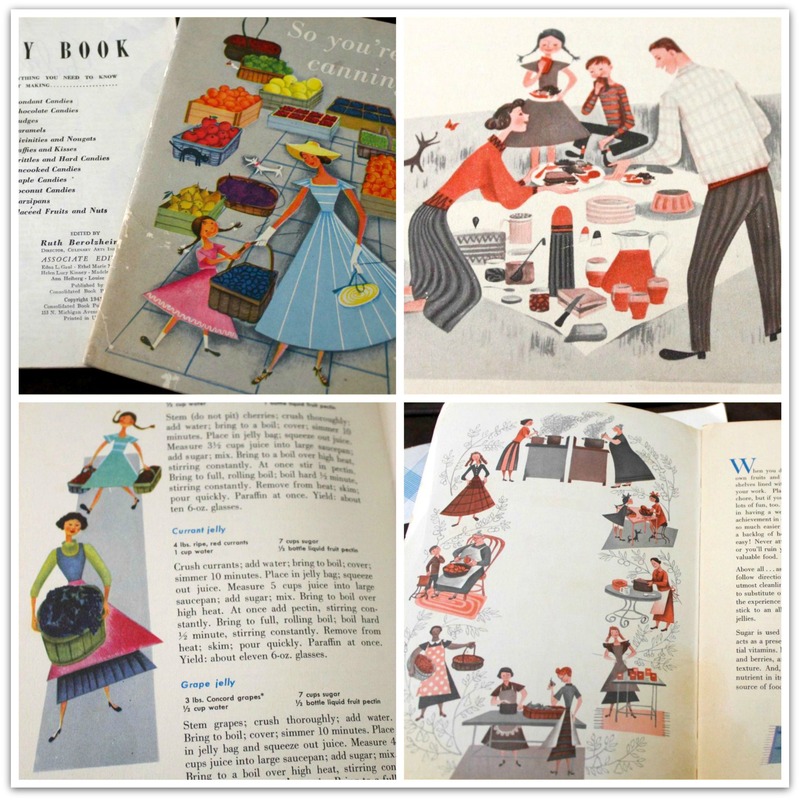 But my favorite squee-inducing gift from Kat is the vintage cookbooks (cookbooklets?) 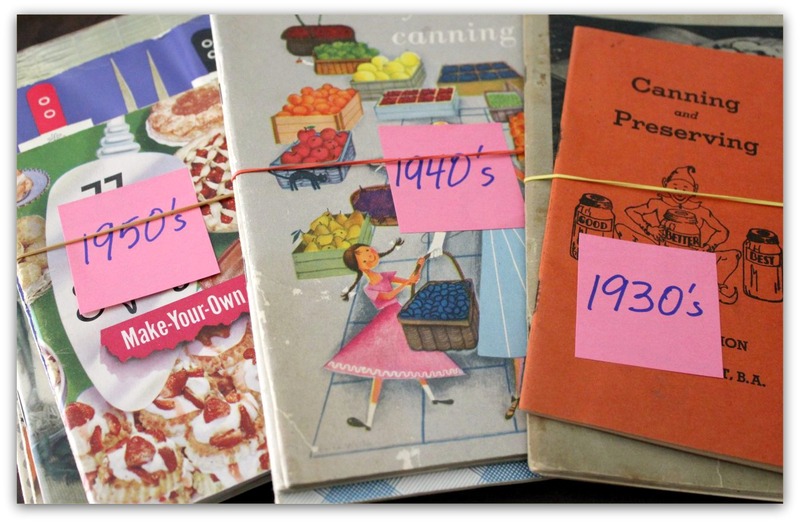 from the 30’s, 40’s and 50’s. Seriously, they are too much fun! 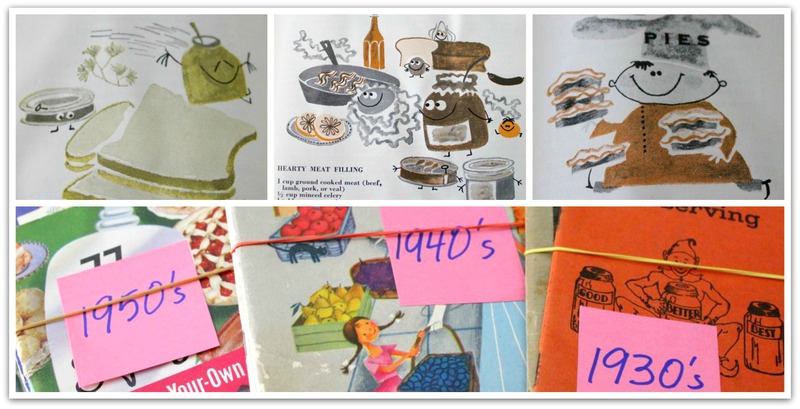 Techniques, ingredients and product sizes may have changed over the years, but the tried & true recipes and killer artwork of yesteryear never go out of style. 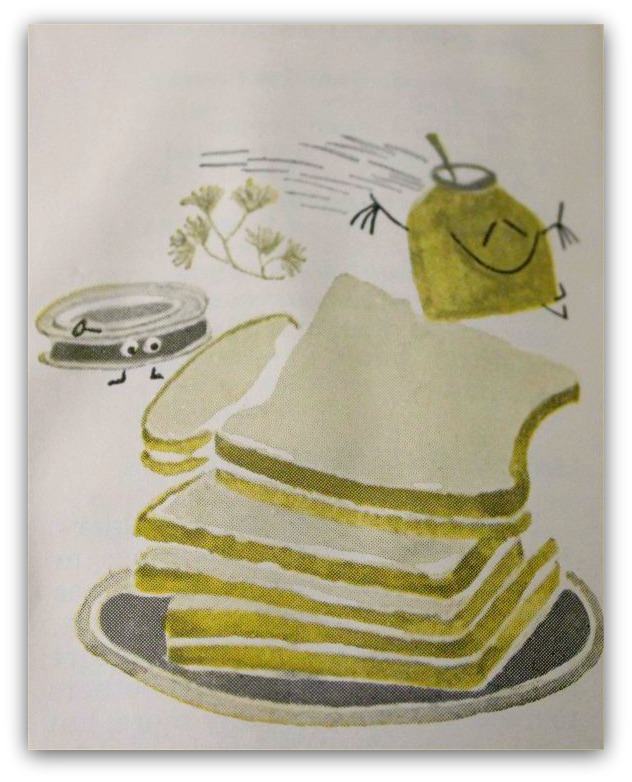 Never has a sandwich filling been so happy to leap onto a loaf of bread. 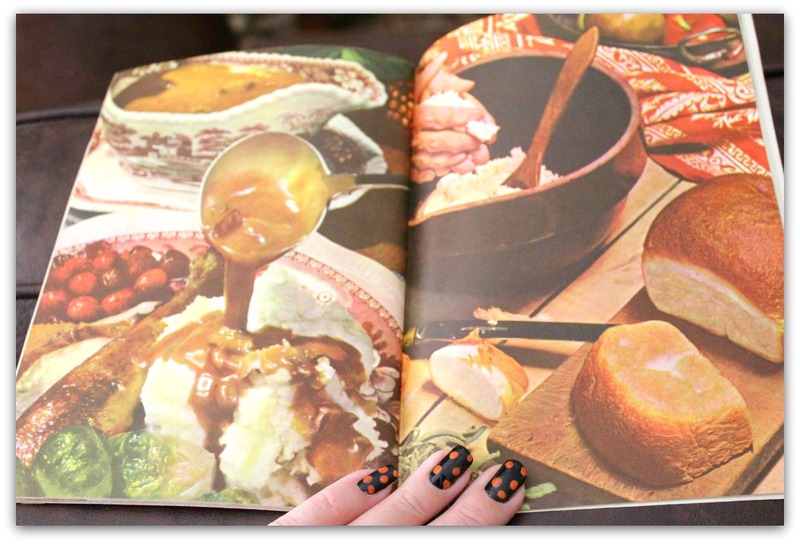 Hello 1950’s Thanksgiving Dinner. Hubba hubba! Please pass the gravy. 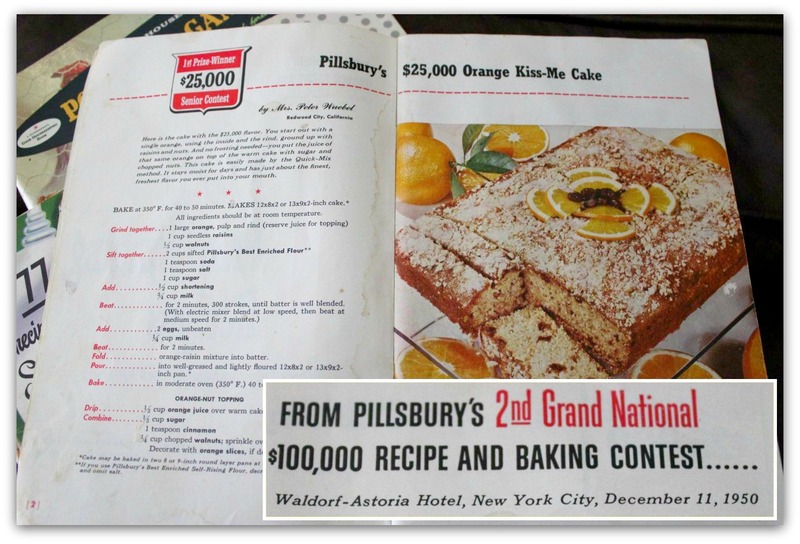 Pillsbury’s annual bake-off contests have been bringing home bakers together through blood-sport baking battles throughout the years, but I had no idea how many years. Kat’s flea market collection included these two vintage gems. That’s the $25,000 winner from the second annual Pillsbury Bake-Off. From 1950. At the Waldorf Astoria Hotel in New York City. Amazing. Also stellar – Mrs. G. Harold Kirk of Bar Harbor, who knows how to dress for an occasion. In an age where people feel comfortable wearing their pajama pants to shop and/or board airplanes, Mrs. Kirk is a breath of fresh air. 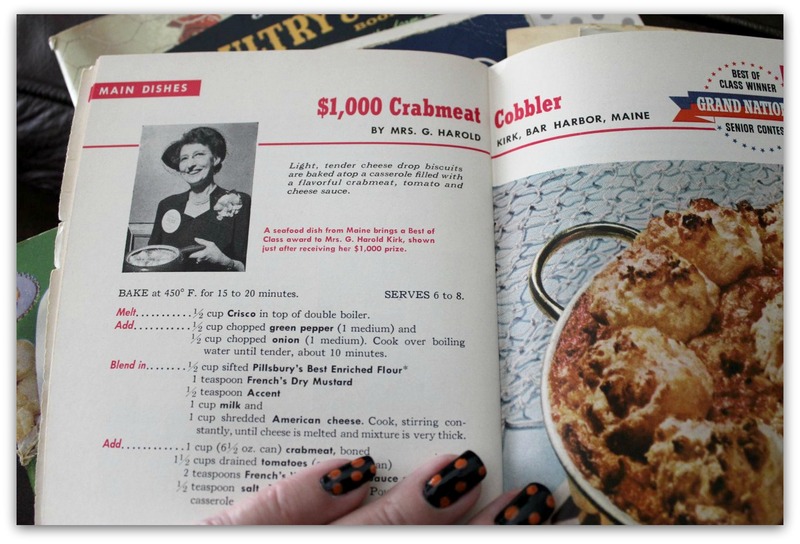 She is, without a doubt, even more fabulous than her prize-winning crabmeat cobbler. 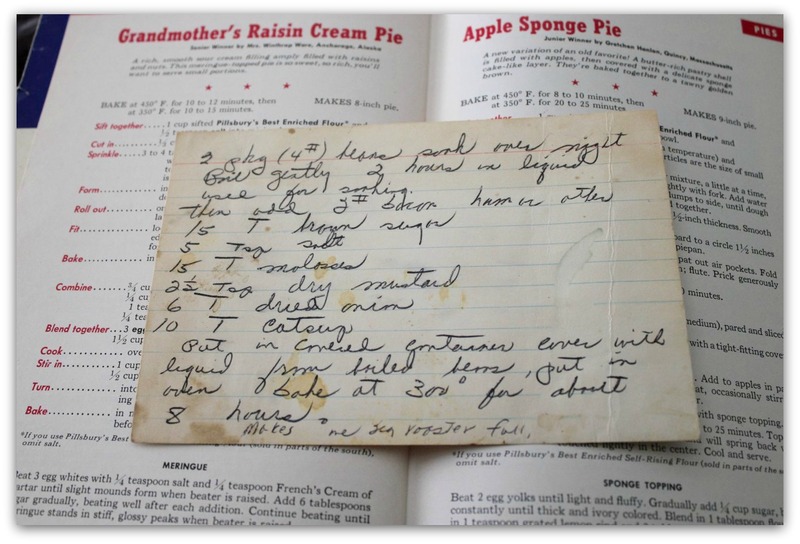 I was super excited to find this recipe for Raisin Cream Pie, since it reminded me of the Sour Cream Raisin Pies of my youth, and then this recipe card fell out of the booklet and I got a bonus recipe for Baked Beans. Like a gift from heaven. The best indication a recipe was loved is the stains all over it. This one was obviously a favorite. Most touching for me, was this wee booklet that still had the mailing label attached. 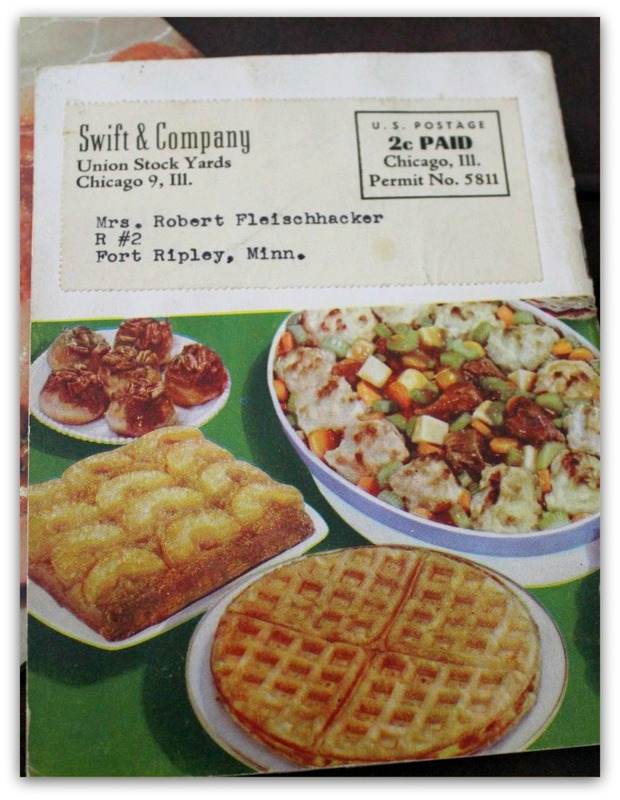 It was a simple shortening recipe booklet from Swift & Co. addressed to Mrs. Robert Fleischehhacker of Fort Ripley, MN. Did you catch that? Two pennies for postage? No way! Most notable was her address – Route #2 with no zip code. These, my friends, were simpler times. 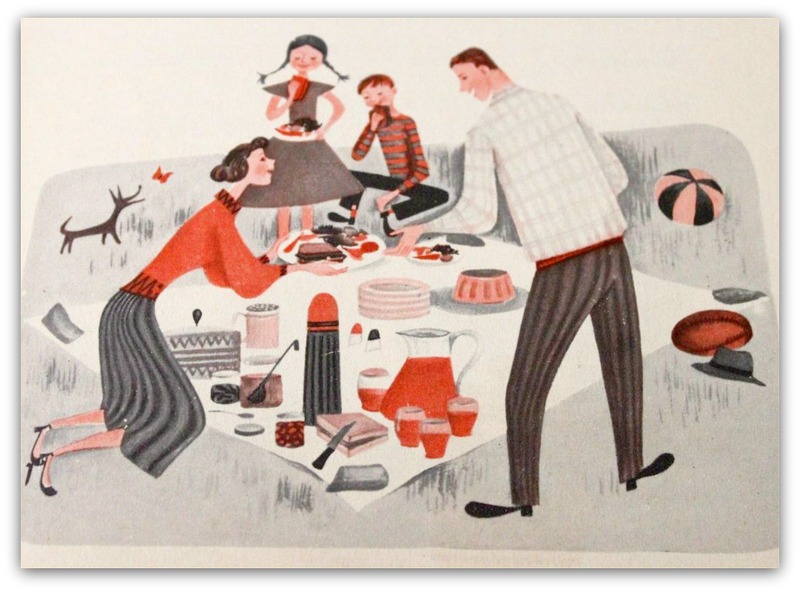 When people knew their neighbors, shared their tables and crafted meals not only from scratch, but with a great deal of love. And just like the recipe booklets, this box from Kat is meant to be shared. I may make a dish soon to share on the blog. 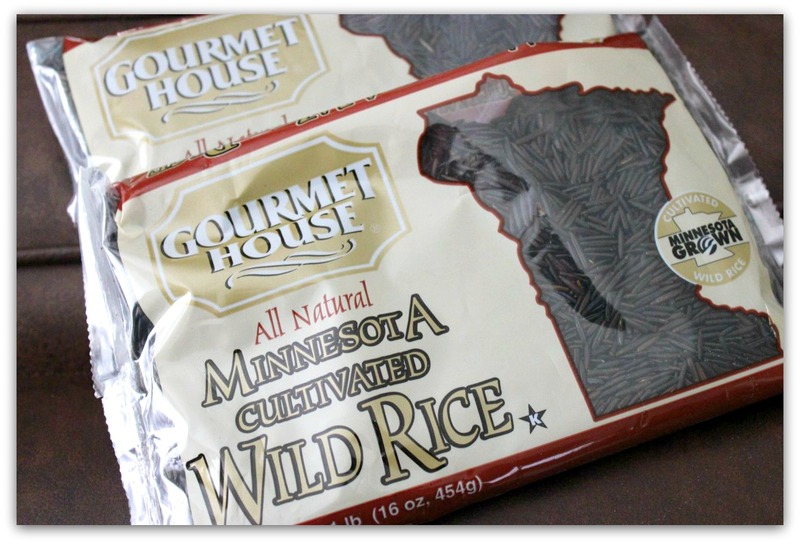 And I’m thinking of baking a wild rice casserole for our extended family at Thanksgiving. But I probably won’t share the chocolate. And just when you thought I was getting sentimental. It’s that time again – time for another OKMH box exchange! I love getting a box of love from my blogging buddies almost as much as I love sending them. This month, my box came from Megan of Country Cleaver fame. Megan hails from the Seattle area and mark my words – she will be a famous foodie soon. She’s destined for greatness and a spot on the Food Network. And I’m going to be a founding member of her fan club. Perhaps even Vice President. 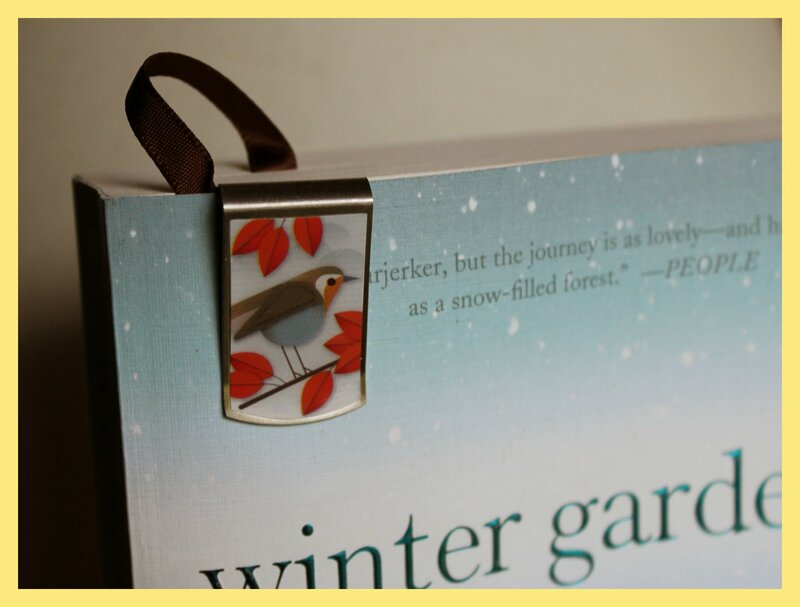 This sweet little bookmark is adorable and Megan’s timing was perfect. I literally just set a new paperback out to read when her box arrived. It was immediately put to use in my copy of ‘The Winter Garden’ by Kristin Hannah. Ever read her stuff? This one tells the story of two sisters who grew up with an adoring father and a ridiculously frigid mother. Without giving too much away, the girls learn more about their mother through the Russian fairytales she shares from her youth. It’s a good story, but overall I think I preferred her other novel ‘Firefly Lane’. If you’ve read any of her other books and have recommendations, please share! 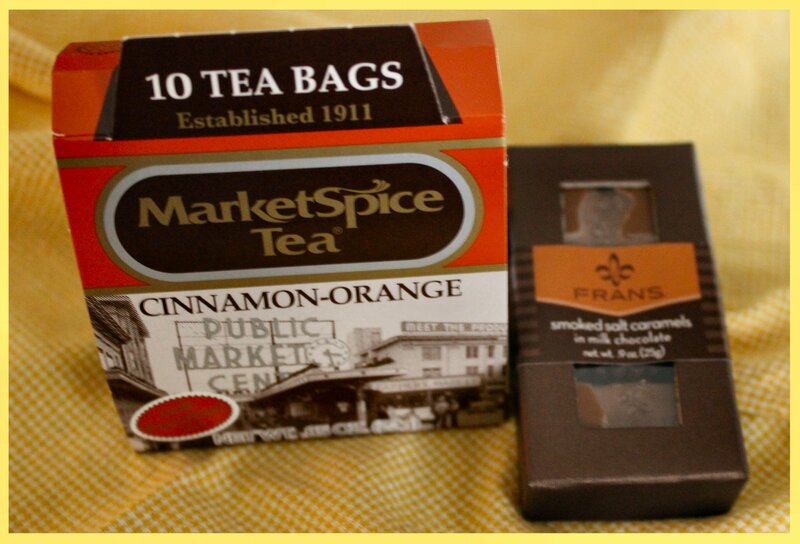 What better accompaniment to a good book and a lazy Saturday than a cup of tea and some sea salt caramels? Again, perfect timing. The caramels died as soon as the box was opened (yes, all 3 of them). The tea lasted longer, but only because it wasn’t rolled in caramel and dipped in chocolate. So stinkin’ good! 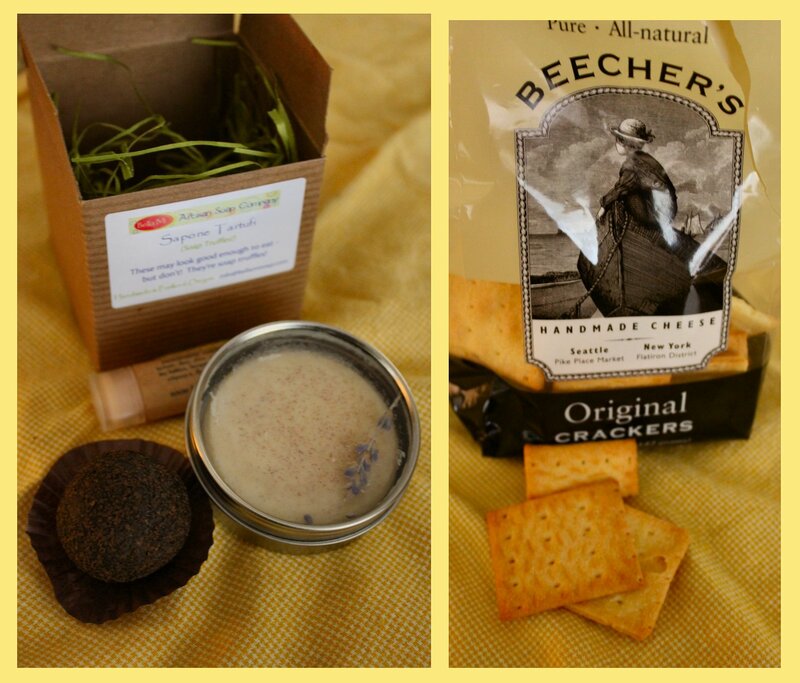 Next up was a spa treatment box filled with lip balm, hand salve and a soap truffle. See my previous comment to know why Megan slapped a post-it note on it that read “Soap Truffle – DO NOT EAT!” She knows me well. She knows me so well, she fostered my obsession with Seattle’s Beecher’s Cheese by sending me a bag of their crackers. Beecher’s is always the first place I hit when we go to Seattle and walk through Pike Place Market. I love that place. If it were possible to die from the over-consumption of fresh squeaky cheese curds, I’d be the first to do it. I could eat them by the tub. Oh wait, I totally HAVE eaten them by the tub. I’m not called ‘The Cheesel’ (like weasel) for nothing, folks. These little pupper magnets have to be the most adorable things ever. There’s actually a Boston Terrier magnet in honor of our beloved Ziggy who passed away in March and a pug to represent our sweet friend Miss Josie Pugglesworth of the Long Beach Pugglesworths. If the magnets didn’t having me smiling ear to ear, the pens certainly did. They’re anti-theft pens for your desk. Why anti-theft? Just read them. Springfield Sexual Addiction Center? Hilarious! I loved everything in my box, but I’ll cherish this card from Megan most. The post-it notes explained each gift, but that sweet card and the love behind it are the real treasure. Our Story: Seven friends meet on the internet via their blogs and become real-life friends forever. And that is the greatest gift of all. Want to see more? 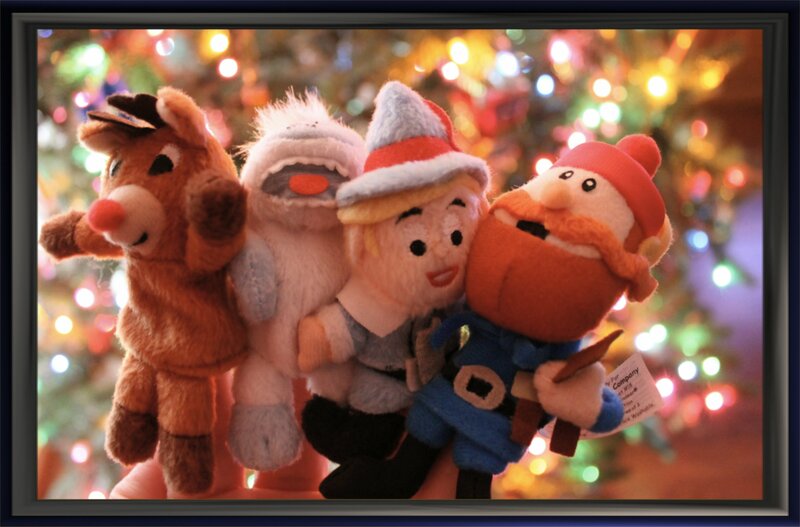 Check out what I sent to Kirsten at Comfortably Domestic by clicking HERE. From there, you can click from blog to blog & follow the fun. 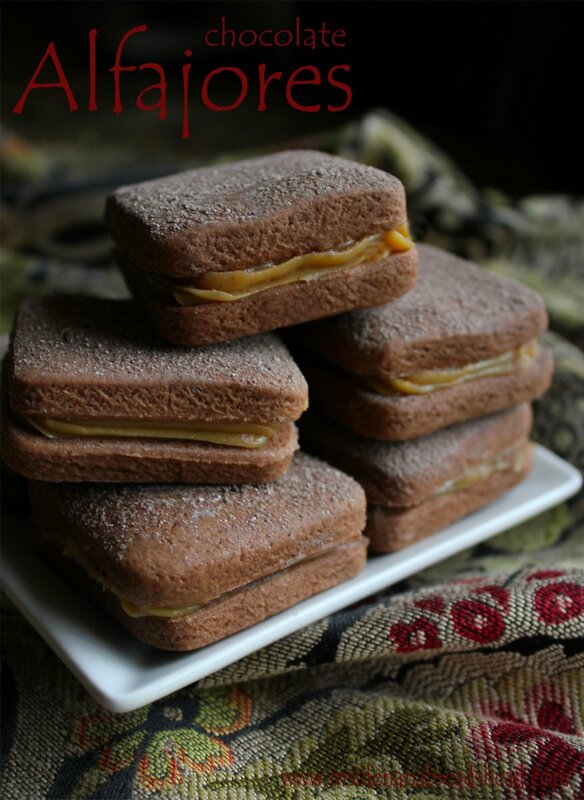 Definition: Alfajores (Al-fa-ho-res) are a South American type of shortbread sandwich cookie that are filled with dulce de leche (caramel filling). These delicious cookies can trace their origin back to the Moorish occupation of Andalusia, Spain and the great culinary traditions of the Mediterranean Basin. To celebrate Caramel Week, I tried a new twist on a traditional favorite – a chocolate version filled with homemade salted vanilla bean caramel, both in the traditional scalloped round shape and a less traditional square. Cream the butter & sugar until fluffy. Add the eggs and egg yolks one at a time, mixing after each addition, then beat in vanilla bean paste or extract until well blended. In a separate bowl, combine the flour, cornstarch, baking powder, salt and cocoa; sift to remove all lumps. 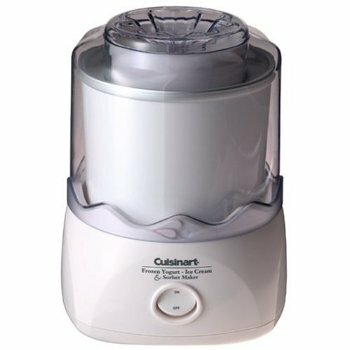 Turning the mixer to low speed, gradually add the flour and beat until it just starts to come together; turn the mixer to medium and beat 10-15 seconds. Scrape the dough onto a lightly floured surface and gently knead the dough into a smooth ball; pat into a disk and wrap tightly in plastic wrap. Chill in the refrigerator for an hour or until firm. Pre-heat the oven to 350F. Line several baking sheets with parchment or silicone baking mats and set aside. Lightly flour your work surface and roll the dough to 1/4″ thick, making sure the dough doesn’t stick to the counter or board. Using a 2″ cookie cutter (round & fluted is traditional), cut out the cookies and carefully transfer them to the baking sheets, about 1″ apart. Place the cookie sheets into the freezer and allow the dough to chill for 15-20 minutes, or until very firm. Once firm, pop them into the oven for 8 to 10 minutes, or until the tops are firm to the touch. Cool on the baking sheet for 10-15 minutes, then transfer to a cooling rack. You can save time by buying a jar of dulce de leche caramel (Trader Joe’s has a great one) but if you want to tackle it from scratch, here’s mine. In a large heavy bottom saucepan, heat the sweetened condensed milk until it comes to a boil, stirring often. Once the mixture comes to a boil, reduce heat to medium and cook, whisking constantly, until it turns a golden tan color. If the mixture starts to thicken, add heavy cream 1/2 cup at a time, whisking constantly. Continue to cook until the caramel turns a light brown shade, adding cream to thin it out some as needed. The finished caramel should coat a spoon thickly, but still pour from the spoon easily. When it reaches that stage, remove it from the heat and add whisk in the vanilla bean paste and sea salt. Allow the caramel to cool completely before using. Lay the cooled cookies out in rows so you can work quickly. I like to place one row ‘bottoms up’ and the next ‘face up’ so I can keep my pairs matched. Scrape the caramel mixture into a piping bag with a star tip and twist it until the caramel is compressed into the bottom of the bag. Pipe a generous layer of caramel onto the bottom side of half of the cookies. 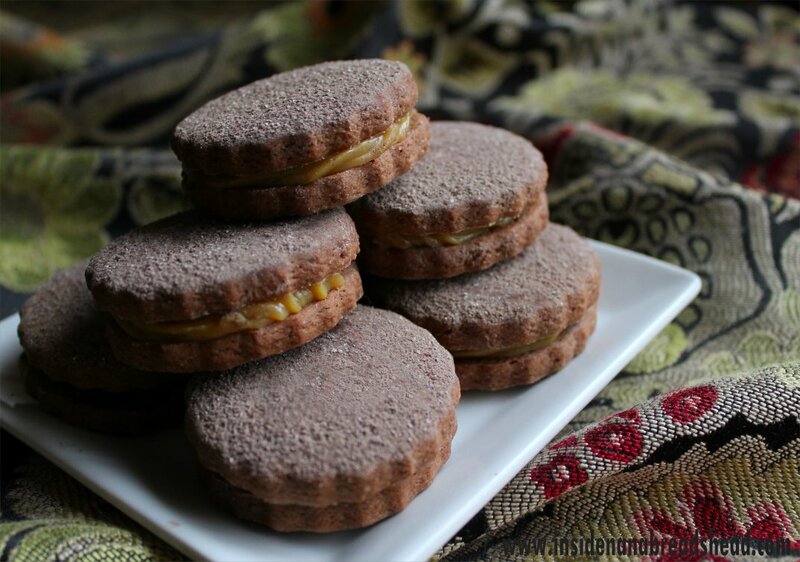 Using the remaining cookies, put a lid on each alfajor and gently press to make sure it’s seated. Once all cookies are filled, dust them lightly with powdered sugar or, as I did, a combination of powdered sugar and cocoa powder. Then try not to eat them all at once. 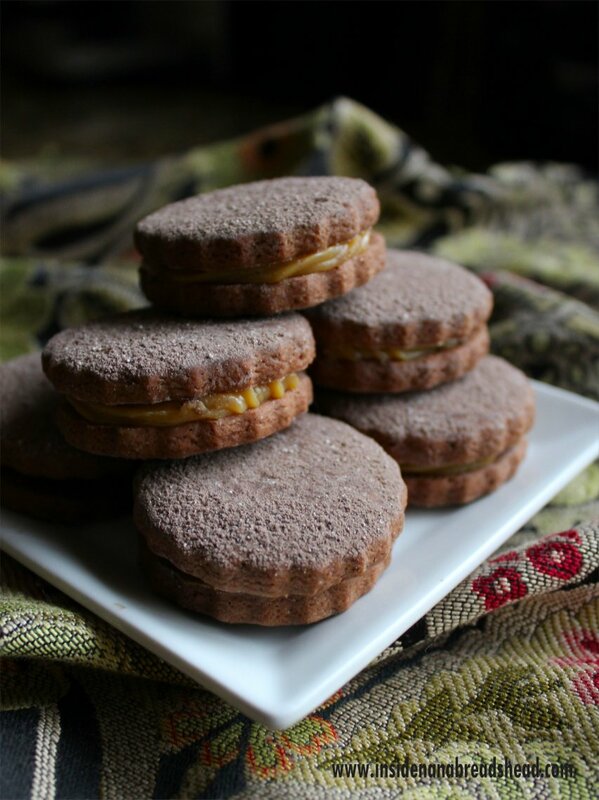 If alfajores have piqued your interest, please drop by my friend Kirsten’s blog at Comfortably Domestic. She baked up a batch using her favorite shortbread recipe and a deep, dark caramel that will make your mouth water. Pinky swear. Recipe Source: The caramel shown is my own recipe. The alfajor cookie dough was adapted slightly from Vianney Rodriguez at Sweetlifebake.com, who used the recipe from The Cookiepedia cookbook by Stacy Adimando. 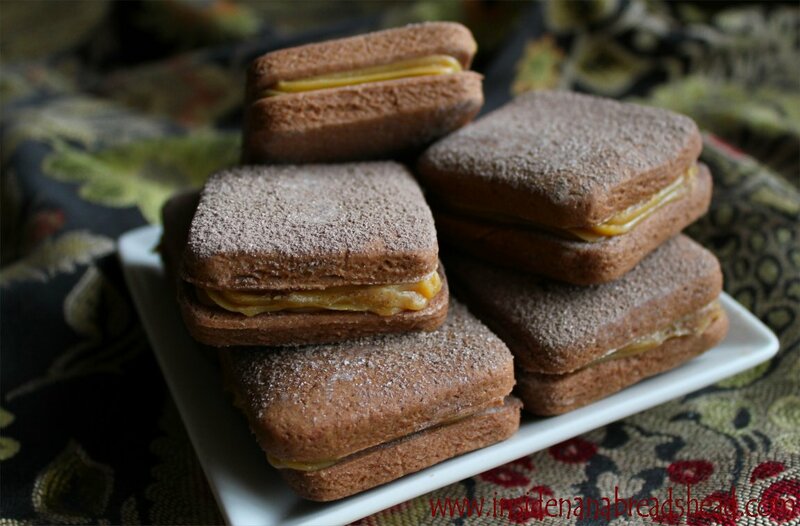 If you’d like to see Vianney’s traditional vanilla alfajor dough, CLICK HERE. It’s 85F in Houston this week. Must be time to break out the flip-flops! It’s always warm in deep south Texas, which explains why we are a flip-flop culture. All across the ‘Southern Coast’ casual flip-flops are our footwear of choice, especially in the summer when temperatures top 100 degrees. I can’t speak for everyone, but my clan likes them cute and cheap. If we can score a nifty pair for under $15, we’re as happy as clams. It also helps us justify having a closet FULL of them. I’m not joking when I confess that I usually have at least a dozen pair of flip-flops in various closets at any given time. I have them stacked in my bedroom closet. I keep them in the coat closet downstairs so I can throw them on for a trip to the grocery store. I stash a pair in the little niche in my kitchen so I can run out and grab the mail each afternoon. And it’s not just me. Most of my friends and family collect them the same way we collect nail polish, sunglasses and souvenir t-shirts. Imagine my surprise when I received a pair of flip-flops from my dear friend Kirsten from Michigan. 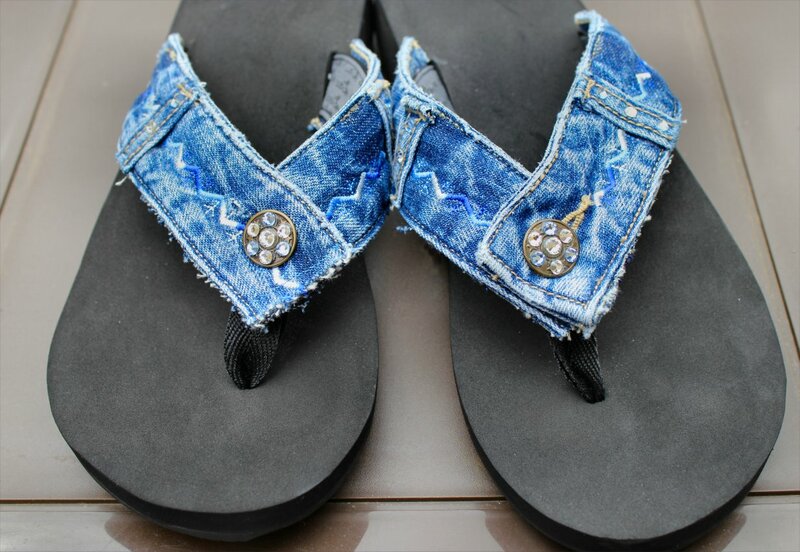 Her BFF Jennifer started a company making flip-flops from recycled blue jeans and she convinced her to send me a pair. How cool is that? As much as I love the shoes, I also love the story behind them. 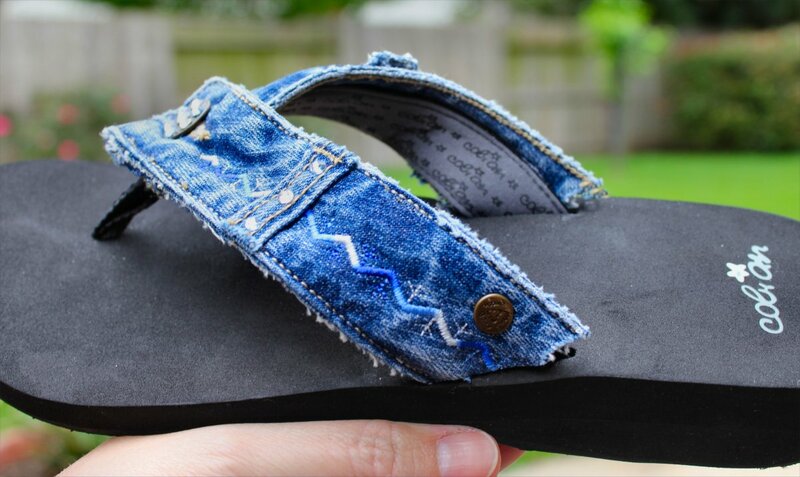 Jeans Gone Green creates unique flip-flops made from blue jeans that go unsold at thrift and resale shops. 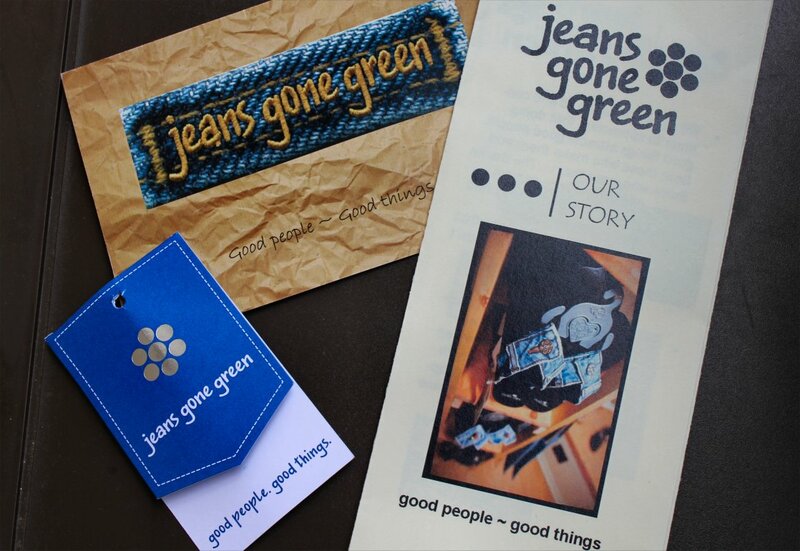 After the unwanted jeans are collected, they’re turned over to Grand Traverse Industries in Traverse City, Michigan, who in turn provides jobs for those with special needs or limited job opportunities. 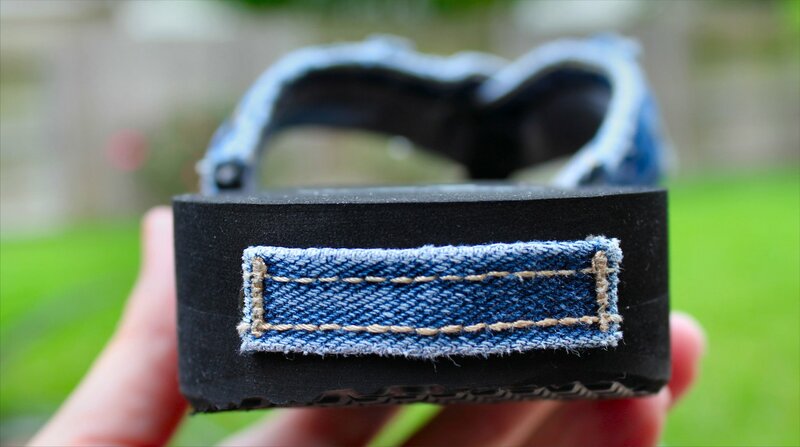 Their employees cut and prepare the denim for a team of artisans and seamstresses who design and create one-of-a-kind footwear. And we’re not talking about plain cheapo flip-flops, folks. We’re talking high-end footwear embellished with Swarovski crystals. No kidding. These are not my run-of-the-mill sporting goods store flip-flops. These are by far the swankiest flip-flops I’ve ever possessed. Another nice touch is the packaging. No clunky cardboard shoe boxes here! Jeans Gone Green packages their footwear in handmade denim bags made from portions of the jeans not used in their shoes. 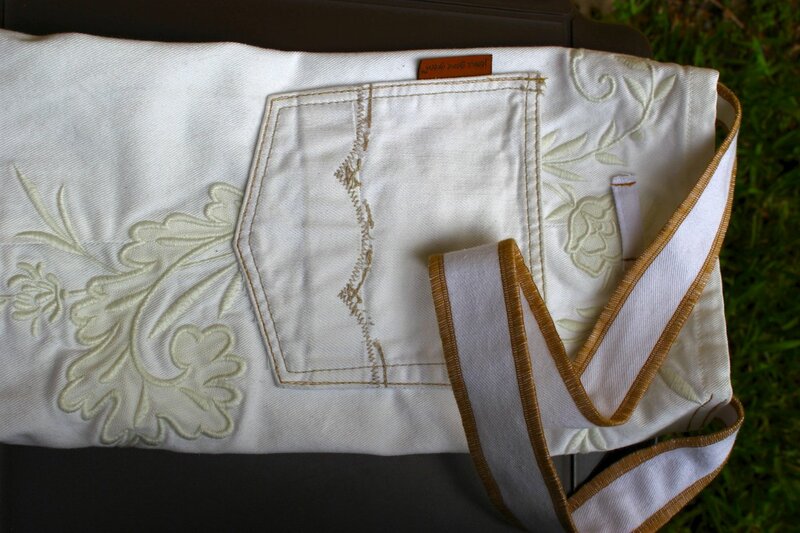 The long, narrow shape makes the bags a perfect size for reusing as wine bottle totes, a e-reader bag, or a beach bag for a rolled towel, a tube of sunscreen and a bottle of water. When they say they recycle old denim, they really mean it. I just love that. Special thanks to my friend Kirsten at Comfortably Domestic and Jennifer of Jeans Gone Green. What a wonderful surprise, ladies. Thanks so much! Note: This post was written of my own volition. I was not in any way solicited, compensated, or reimbursed to promote Jeans Gone Green and/or their footwear. These were simply a gift from a friend. I am sharing them with you because I loved them and thought you might, too. Furthermore, I will in NO WAY be compensated or reimbursed for any purchases made using the NANABREAD discount code. That has been offered by the owner of the company as an unsolicited gift to readers of this blog. You are in no way obligated to make a purchase. If you do, it may help to note that mine ran a little small, so you may wish to order a size larger than you normally wear. And that means Friday is just around the corner. Do you have any big plans for the weekend? Our family will be celebrating a birthday. Happy birthday, Jonah Bear! You're five and I'm stunned. Jonah (our grandson, if you’re a new reader) turns 5 next week. I can hardly believe it. I honestly remember the day he was born like it was yesterday. He scared the water out of us. We thought we’d have time to drive to Austin for the big day and be there to hold My Baby’s hand to see her through the birth of her first child. Instead, little Jonah Bear went into distress and an emergency c-section was performed. That drive from Houston to Austin was the longest 3 hours of my life. Don’t worry. The story has a happy ending. He ended up being fine and we got there just about the time our daughter was settled into a room. When we saw Jonah for the first time, he was pink and swollen and wearing a knit cap. He looked like a tiny boxer that lost a really long bout, and we immediately fell in love. Now he’s a healthy, happy, funny boy who absorbs every detail like a sponge. 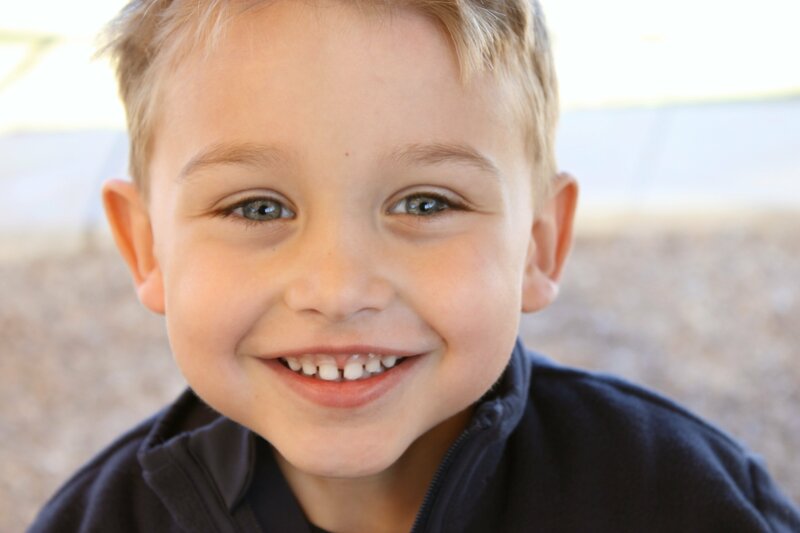 He has a heart as big as Texas and a smile that will melt your heart. 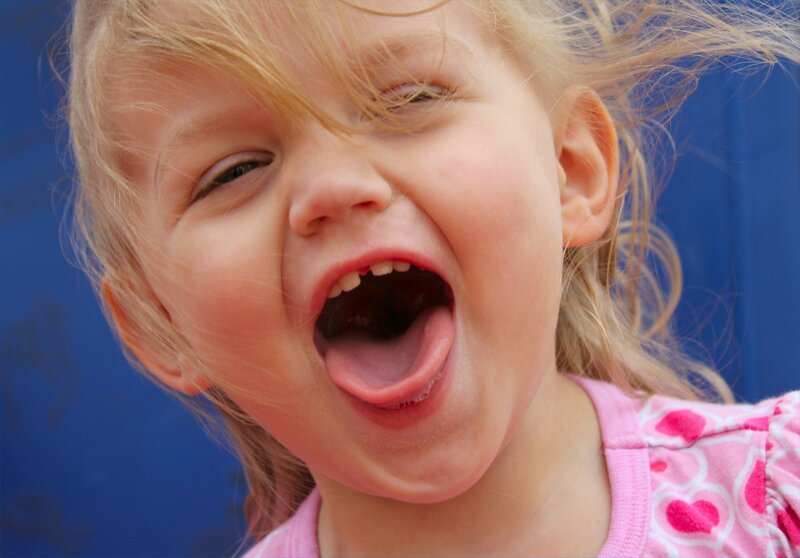 He is one of our greatest joys in life (as is his spunky little sister, Lilly Bug). 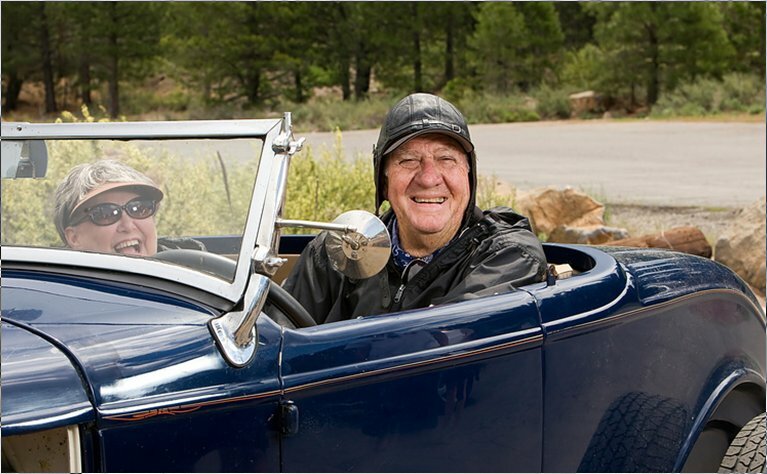 Hang onto your hats! Lilly Bug is in da' house! Be A Good Cookie Week benefiting Cookies for Kids Cancer continues! It started with Kirsten at Comfortably Domestic on Sunday night when she announced what our blogging circle of friends was up to via the Cookies for Kids Cancer: Best Bake Sale Cookbook. (Sidebar: For a great take on what we’re up to this week, click here). On Monday, she started the week with a walk on the savory side with Parmesan Cheese Bites laced with cayenne pepper. My mouth still waters just thinking about these little gems. They are on my holiday “to do” list for sure. My Toasted Coconut Shortbreads were up next (on Tuesday). I’m saving these for a cookie exchange playdate next week, and let me tell you – it has been a challenge not to dig into that tub-o-cookies in my fridge. Yesterday, Megan at Wanna Be A Country Cleaver knocked my socks off with German Chocolate Cookies. Coconut, nuts and German chocolate in a warm, gooey cookie? Yes, please! This morning, I awoke to Oatmeal Chocolate Chip Cookies by Kat at Tenaciously Yours. Now THAT is a breakfast, my friend. And because oatmeal is involved, you can bet I would use that excuse to eat them at 7am. Or 8am. Or all day. Her 1-to-1 chocolate to cookie dough ratio rocks. Still to come this week – Mads at Le Petite Pancake and Allison at Decadent Philistines Save the World. I don’t know about you, but I can’t wait to see what these ladies are baking. There’s a rumor going around that homemade gingersnaps may be in the works. GAH! Oh, and hey let’s not forget there are two giveaways going on for Be A Good Cookie Week! 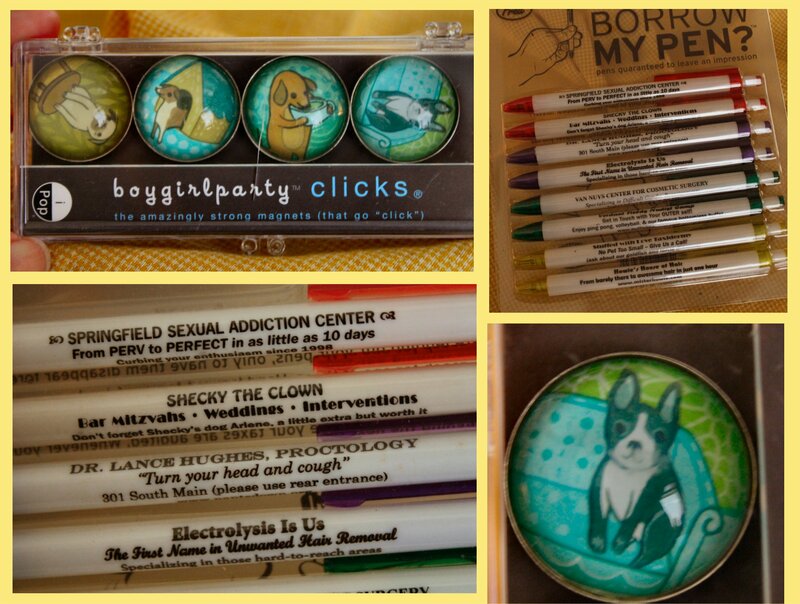 Click here to enter Kirsten’s giveaway and click here to enter mine. That’s two fabulous baking giveaways so you can bake your own holidays favorites and support Cookies for Kids Cancer at the same time. Better hurry – both giveaways end this weekend. 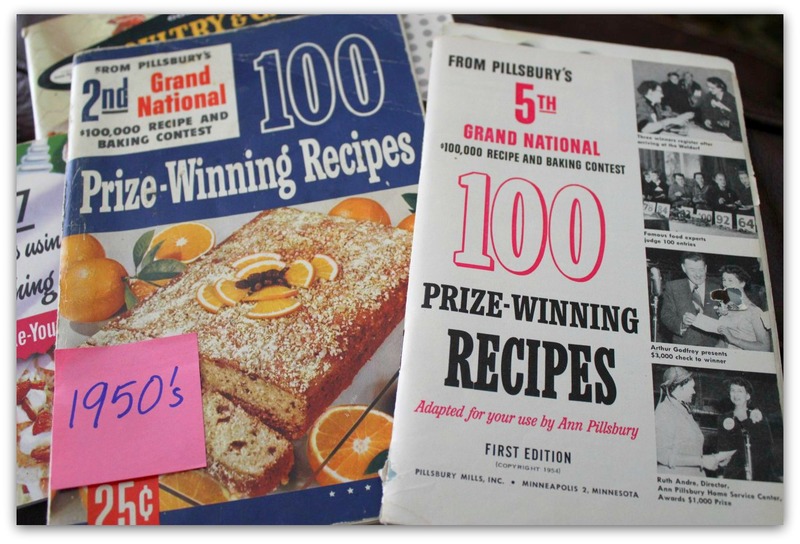 You don’t want to miss your chance to win, or these fabulous recipes. With all the decorating, shopping, baking and everything else that goes with the holidays, I’ve noticed that I’ve let a few things slide. For example, I really need to strip our beds and wash all the sheets. My pantry shelves are a mess and need to be emptied, cleaned and reorganized. Don’t even get me started on the closet in my sewing room. I’m afraid to even open that door. Most shocking, though, was what crawled out from under my sofa yesterday. Hello, little dust bunny! If I weren't horrified, I'd think you're kinda cute. Best thing about wood floors: they’re easy to care for. 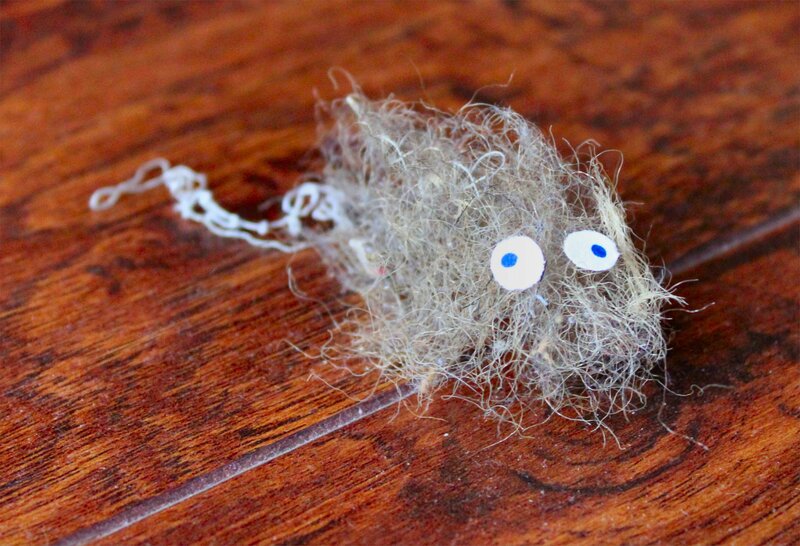 Worst thing about wood floors: dust bunnies made of rug fuzz are highly visible. Okay, kids. That’s all I’ve got. I’m off to strip beds, bake more cookies, and avoid closets at all cost. Hope you’re having a wonderful week, and that your weekend is even better. PS – Did you hear about the reindeer that got loose on I-45 in Houston yesterday? Evidently, they busted out of their trailer and ran amok on one of the busiest freeways in town. Chaos ensued. Reindeer wranglers were called. No animals were harmed by their shenanigans, and all is well. I wish I’d seen it with my own eyes, though. Just the thought of it sleighs me. And I’ll leave you with that golden nugget. For the record, I am not dead. Although, if I were, it would make me supremely happy to know that this little guy was hanging out with me. I know it has been two weeks since my last post, and for that I sincerely apologize. It wasn’t until a reader checked in on me that it really sunk in. I’ve been a terrible blogger this month. 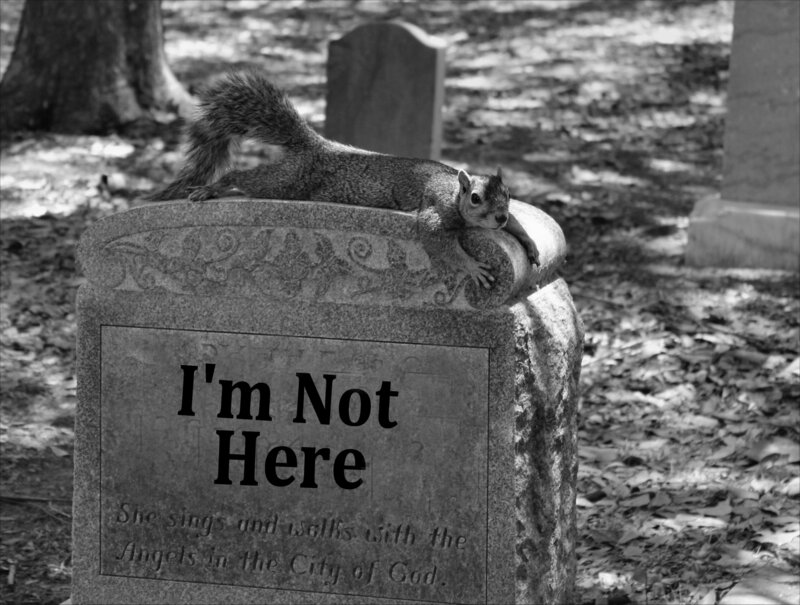 The good news is this – I am not dead. I’m not even sick. My allergies are bugging me a little, but it’s Houston in the fall and that’s completely normal. Annoying, but normal. Fact is, I’ve just been a little too focused on other things. We were out so much for our long vacation and a week visiting family for Thanksgiving and a long weekend with the grandkids that I kind of got busy trying to make up for all that. We got our broken attic door fixed, so The Complete Package and I were finally able to drag all the Christmas decorations down. 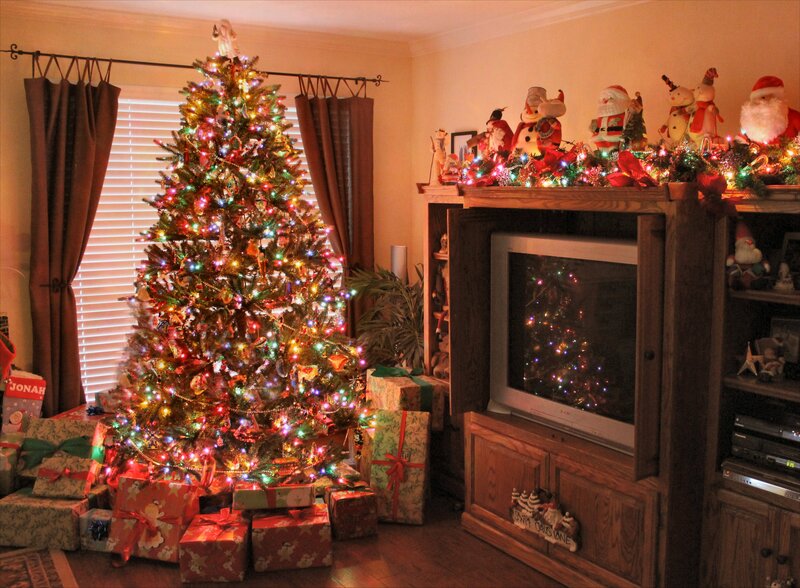 I spent 2 days unpacking it all, putting the tree up, and decorating the family room. Contrary to previous years’ decorations, I decided to focus all my Christmas cheer on one room instead of the entire downstairs. It has worked out pretty well, since it’s the room we spend most of our time in. Or at least that’s what I’m choosing to believe this year. One room is enough. Nothing beats sitting in a room at night with the lights from the tree casting a warm glow around the room, especially if there’s a fire going in the fireplace at the same time. I love our family room during the holidays. See? When I said I finished my Christmas shopping, I wasn't lying. I mixed up a ton of shortbread cookie dough for Cookie Week, which just happens to start Monday over at Kirsten’s Comfortably Domestic blog. It’s like Pie Week from November, but with cookies and a cause instead. Six bloggers are selecting six recipes from the Cookies for Kids Cancer: Best Bake Sale Cookbook to feature on our blogs this week. My post will be up Tuesday, but please click here to check out Kirsten’s posts. She’s kicking it off Monday with a savory recipe and from what I understand, it was good enough to inspire snacking right out of the bowl – before they were even baked. Now that’s gotta be a good cracker. 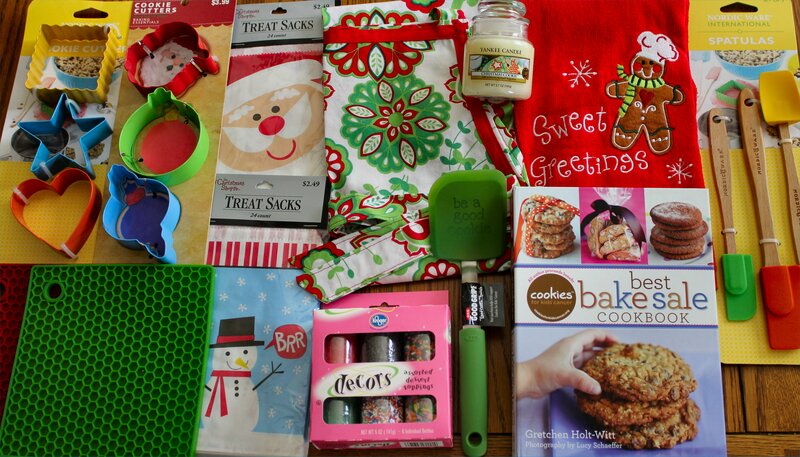 PS – I’m doing a giveaway with my cookie post and so is Kirsten. Here’s a sneak peek at what I’m giving away, so don’t forget to drop by Tuesday and enter. And visit Kirsten’s blog to enter her giveaway, too. If you haven't tackled your holiday baking, you're going to want this. Last week, The Complete Package and I spent two whole days sitting in a big tall building in downtown Houston for a retirement seminar. It’s hard to believe we’re attending stuff like this since he’s 54 and I’m 48, but the truth is this – you can never start planning for retirement too early. And frankly, even then it’s a crap shoot. But we enjoyed the seminar, and we learned some things we didn’t know and need to look into, and we feel like we’re better prepared to move forward. And that counts for something. Or at least it should. The Complete Package made homemade pomegranate Turkish Delight last week. It was an experiment in recapturing his favorite sweet from our last vacation. It took one full week to ‘set up’ and the results were disappointing. Too soft – the texture just fell apart when you touched it instead of being the consistency of a soft gummy worm. But all is not lost. We have other recipes and techniques to try, and try again we will! As a bonus, we had leftover pistachios and we’re planning to try homemade pistachio ice cream soon. See? When God closes a door, he opens a window somewhere else. Time to break out Christine again. She's evil; pure evil. This weekend, TCP picked up one of his Christmas presents early. I don’t want to let the cat out of the bag, but it’s black and shiny and produces grilled and smoke meats in an outdoor setting. Okay, so that’s not so subtle a hint. 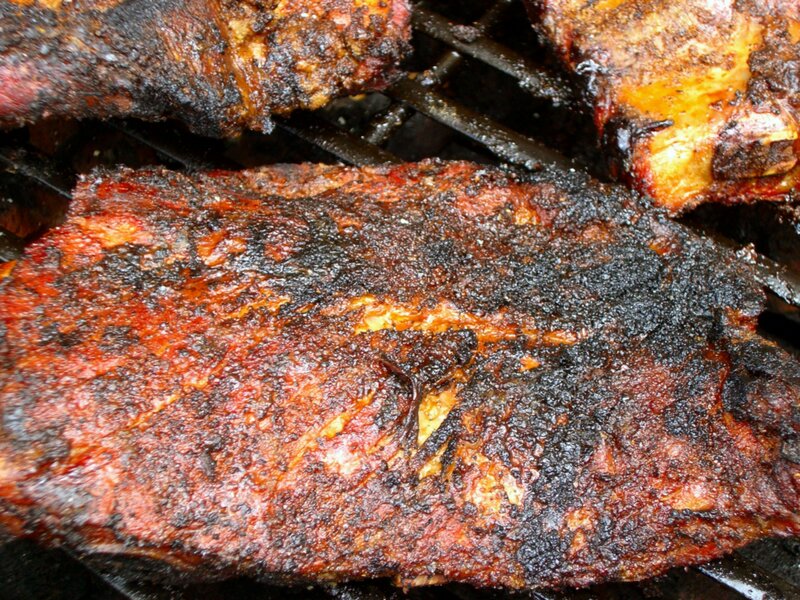 The upside is that we’ll be enjoying smokey meat for years to come. The downside is that it came in a huge box and looked like the assembly instructions for an entire Ikea living room set. He spent 2 days assembling the darn thing. It’s up, it’s seasoned, and it’s ready to roll. Now we just need 200 pounds of cow or pig to fill it. I’m not kidding – this thing is a beast, and TCP is determined to tame it. TCP's smokey pork ribs. I'll have what he's having. I’m hosting a day of cookie baking with friends next week. We’re going to bake holiday cookies all day, with each of us making a different cookie. While it’s all baking we going to hang out and play cards and visit. When it’s all done, we’re going to divide it all up a la cookie exchange so everyone goes home with a jumbo tray of mixed goodies. I can’t wait. Something about this Christmas just seems shinier and brighter. Maybe it’s the colder weather we’ve been having. Maybe it’s that our decorations and tree are finally up. Maybe it’s Cookie Week with my blogging friends and our cookiepalooza day next week. Whatever it is, I’m all in. I’m looking forward to this Christmas more than any other. How about you? Are you looking forward to the holidays? Will you be traveling to see family and friends? Are you listening to that radio channel that plays nothing but holiday music in your hometown, or dragging out your holiday CD collection at home? Are there any favorite TV specials or holiday-themed movies you just HAVE to watch every year for the holidays? And lastly – and this is an important one – do you drink eggnog, and if so do you add booze or no booze? 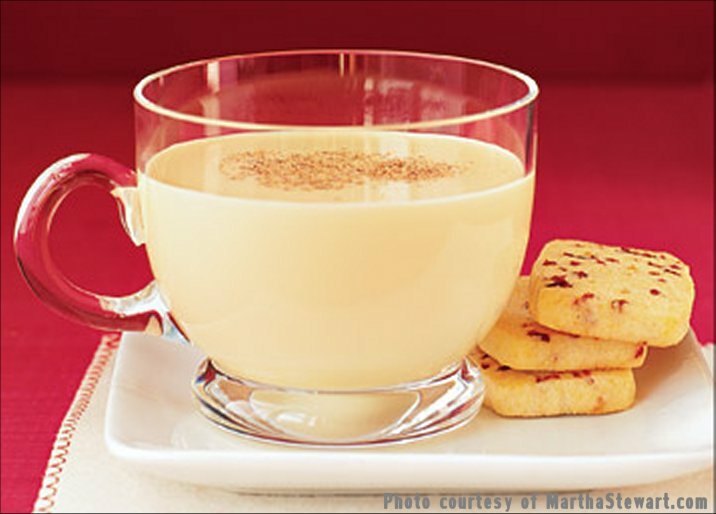 Personally, I’ve never been a big fan of eggnog, but I could be persuaded… with the right recipe. If you have one, feel free to share! What's the story with eggnog? Booze or no booze?